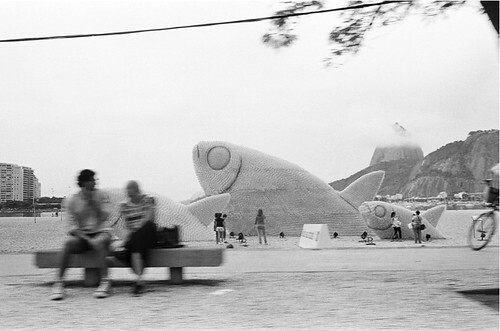 Giant fishes made with plastic bottles, backdropped by a silhouette of the Sugarloaf Mountain, Botafogo Beach, Rio+20. Rio de Janeiro. The exhibition is a photo reportage in Black & White outside the historical RIO+20 conference, in Rio de Janeiro organized by the United Nations this past June, and of the numerous side events that complimented that event as reported by Conceição Praun. This exhibition co-insides with Ms. Praun continuous efforts to coordinate with the annual Conferences of the Parties (COP), since Ms. Praun’s involvement beginning in 2009. Conceição Praun, was born in Olinda, Pernambuco in the north east of Brazil. Ms. Praun developed an interest in the complex processes behind the "camera obscura," (Dark Room) and learned the principles of this optical device while living in London. There, she had her first showcase followed by others. Ms. Praun then moved to Paris where she met George Fèvre (1930-2007), the master of photo development and who was an apprentice to Henri Cartier-Bresson, an established photographer. This relationship encouraged Ms Praun’s deep appreciation on his theory of ‘l’instant décisif’. Fèvre became Ms. Praun’s mentor and exercised a great influence on her career, making her promise that she would focus into the metaphysical contrasts of black and white. Her photographs are based on the characteristic of spontaneity over prose and composition, in between clear and hazy atmospheres. Praun travels the world seeking to highlight the conditions of social and environmental circumstances in order to create awareness on society’s behaviours.